Keith McKellar built his 69 Dodge Dart from scratch. The construction began on December 1st of 2003 and the final product was rolled out June 13, 2004. It took various tradesmen and hundreds of hours of labour to create the race car that you see on the track today. Let's break the construction of the car down into stages and with each stage you will learn what Keith did and who helped to construct that particular part of the car. McKellar purchased a used Dodge Dart then cut and trimmed the car like one carves the Christmas turkey; some pieces were thrown away and some used! He saved the upper skin and quarter panels. Almost nothing was left of the old car when he was finished cutting and carving. Then he started to construct a brand new car. 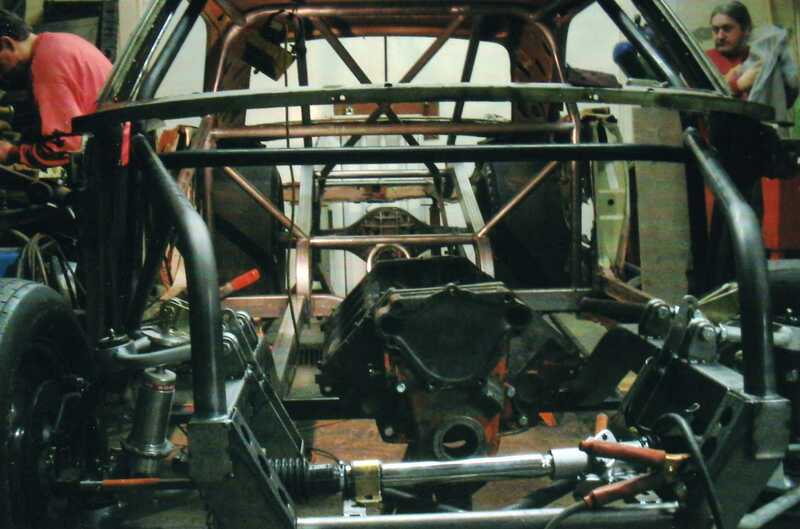 In the beginning of the project the race car as we see it today looked nothing like the shape and metal forms you see in the photos. To the right you can see the rusted old frame taken apart. 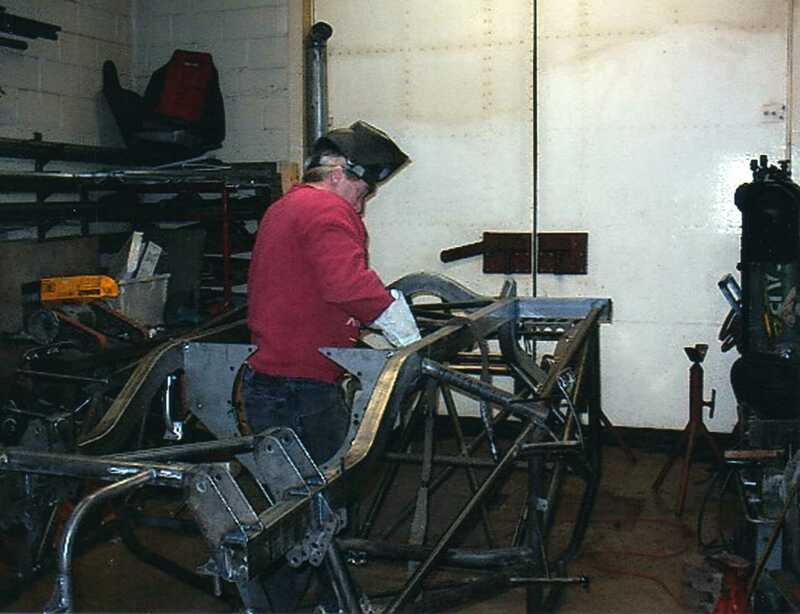 The steel frame was constructed of chrome molly tubing. In the photo to the right take note of the tig welding. 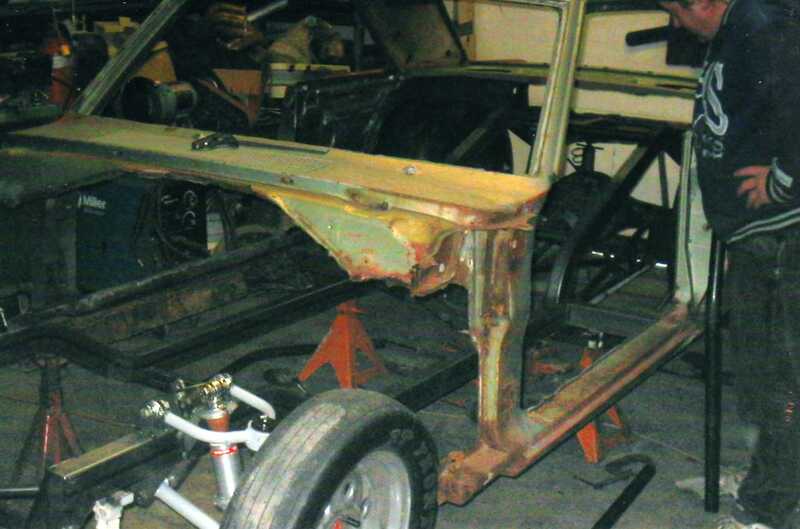 This type of welding was the specialty that was used to create a near perfect car frame. In the bar assembly you can see the triangulation. Every angle must be exact and as near perfect as the welder can get to create strength. Note the bending of the bars and the tubing. Everything must fit and work just right. After all this chassis will run a 175 mph down the race track! Thanks to Tommy Thorne of TT Fabricating the frame was just right! Obviously a car like this must have its very own shape. This is done by making every floor piece etc. fit just right. To complete the job the men made the shapes first from bristol board. Just like sewing one must first create a pattern and then the shapes are all traced onto light aluminum and very carefully cut out.This was designed and cut out by Bob Richards. Of course all of these pieces must then fit onto the frame. Here you can see the tin work on the flooring. The seat and driver will eventually sit on this very spot speeding down the raceway. The next stage is to paint all of the frame and the car parts ready for assembly. 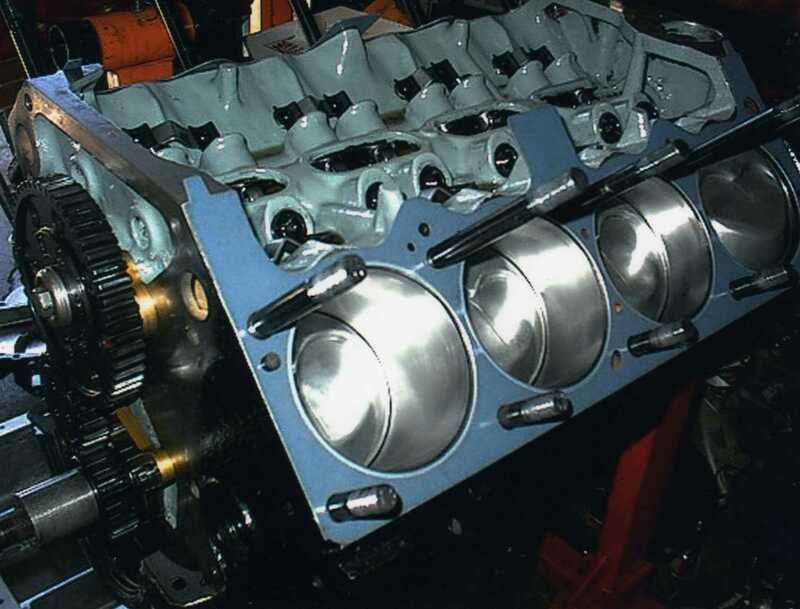 The engine is based on the original 340 cubic inch design. Here we see a 'fresh' motor ready to be put into the chassis. Remember everything must fit. Everything has a place and that area must be created just right for the car to work! To the right is a great photo of clean cylinders and a painted block ~ a perfectly prepared block. This motor was dyno tested at 8,000 rpm and produced over 670 horse power. 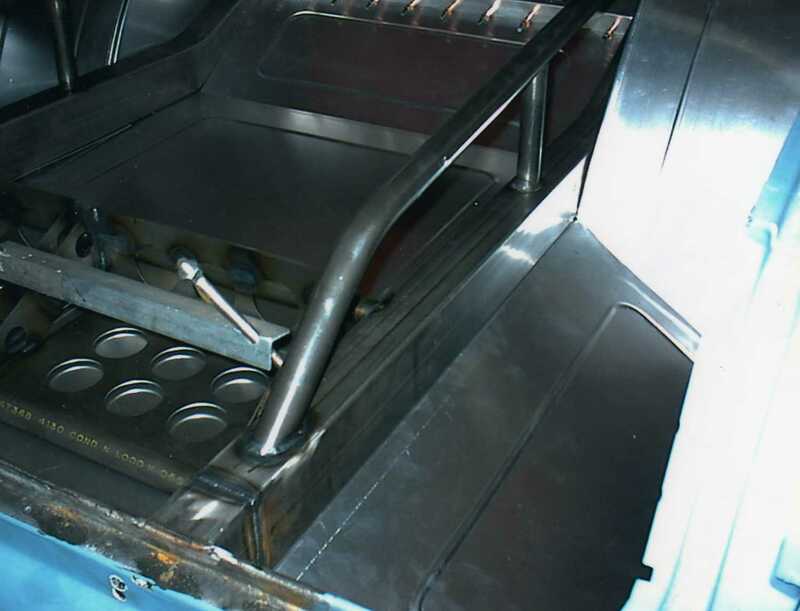 This particular testing was placed in the capable hands of Dave and Scott Koffel of the famous Koffel's Place(B-1 Cylinder Heads) of Ohio, USA. Assembly of the car was done by Keith. 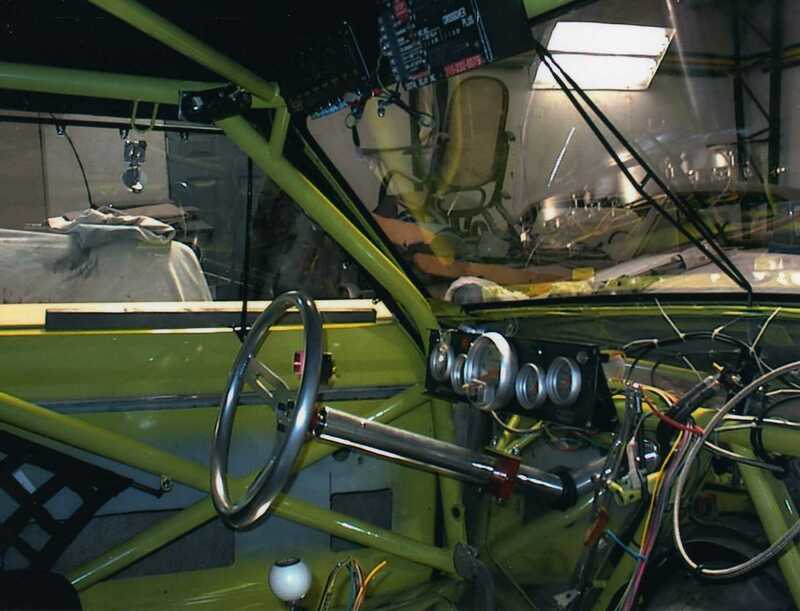 In this photo you can see the wiring near the steering column. The paint job; both the frame and skins were done by Ric Aiello from Low Blow Custom Cars and the Flames were done by the famous racer and painter Don Mac Arthur (Mac). In the fall of 2004 Mac put the finishing touches on the design by edging the flames in purple. Even Keith's helmet was painted by Mac to match the car! 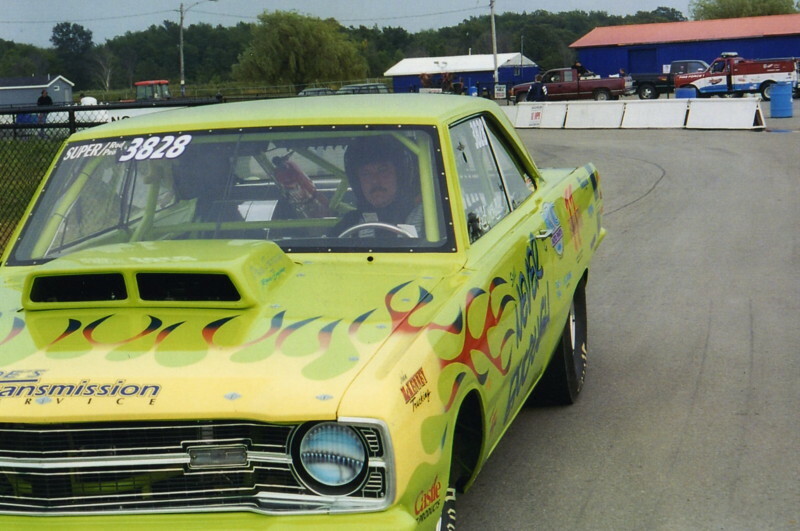 Firing of the car (first time the motor turns over) took place in early June just days before the lime green 69 Dodge Dart's debut at New York International Raceway. The car was rolled out June 13, 2004. Since then it has been featured at car shows, written up in magazines and of course raced in Canada and the US. In 2009 Keith and his family were invited to Las Vegas to race the car. As Keith stated "When all is said and done, no one teaches you how everything fits together and where everything goes. It is a day by day learning process, but also no one can explain the immense satisfaction one feels in completing such a project." "It was a great ride but now it is time to say goodbye"
"It was a helluva ride!" "Thanks to so many who helped but especially these professionals who gave of their time and talent." "Without you the dream would only be that..A Dream.. Keith"